Starting from Jun 1st 2017, PCL41 will be discontinued. As a possible substitute, please check out the DPG4000 Kit for details. The PCL41 Series pressure standard incorporates features found in high-end standards into an affordable, portable benchtop unit. The microprocessor-based controller allows the user to adjust display filtering for the particular application. The front panel tare allows zeroing of the display with a single pushbutton. Testing pressure switches is done by utilizing the display hold capabilities of the microprocessor. An external connection is completed when the pressure switch under test changes state. The switch freezes the display, which shows the true actuating pressure. The microprocessor allows adjusting of the unit for increased or decreased resolution. 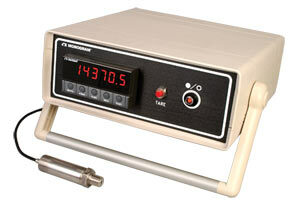 All options associated with the DP41 panel meter are available on this benchtop unit. Combining the PCL41 with its unique options can turn the unit into a sophisticated data collection system. Scalable analog outputs, RS-232 or RS-485 communications and mechanical relays are all available options with the PCL41. 注: All models come with power cord, NIST traceable calibration certificate and operators manual.